Everyone loves getting mail, especially if it's purchases that you bought for yourself. In my case, I got so many packages within these past two days! Many packages for me were already becoming a sight at my apartment complex's small pick up mail room. Normally, I can control my spending habits, but these past two months, I have gone over my monthly sanrio budget. ^ The My Melody "Pipi & Popo" series is a very sweet design and it does help that the main color scheme is pink overrall. I like *red* My Melody, but I really prefer seeing a pink colored My Melody version. My favorite out of all the series is the big Plush one. The pink footprints is a very pretty cute detail on the plush, making it a "must-have" when I first saw the picture online. Both plushes are a matching pair that I couldn't just get one without the other. One is holding Pipi and the other is holding Popo. "My rabbit Pipi and my bear Popo are my very own special treasures. Sleep, teatime, we do everything together!" 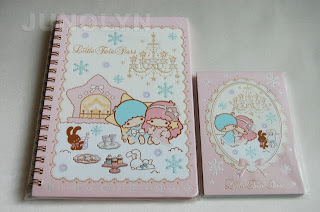 The Little Twin Stars "Romantic" series notebook pair is really another great addition to my growing LTS notebook/memo pad collection. Though, at first when I saw the design of the star hair bow accessory on Lala's hair, I wasn't feeling the love. It has a sort of "could have been prettier" design, but I think on the products, it still looks great! I have more Little Twin Stars of the *Romantic* line coming to my doorstep from Hong Kong. Can't wait to receive them. This series line has a Christmas theme to the design and just in time for the holidays.